This annual release is always highly anticipated for its prime relics and autographs from the year's best rookies. 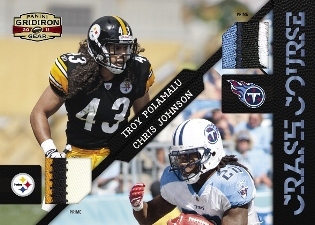 Released around the season's mid-way point, the timing of 2011 Panini Gridiron Gear comes at a point when certain rookies are really starting to shine and others start to lose their luster. With a rookie checklist that doesn't go too deep into the draft ranks, chances are good that of the four guaranteed hits per box, at least one will be a real gamer. The 250-card base set consists of 150 veterans and 100 short-printed rookies seeded at a rate of one per pack. In addition, each rookie card comes in two autographed parallel versions. Gold autographs are numbered to 299 while Platinum Autographs are numbered to just 25. Supplementing the base rookie cards, are the always-popular Rookie Gridiron Gems, which has been scaled back to just 36 players this year. However, each comes with a variety of versions with an assortment of material and relic swatches. All of the top rookies of 2011 are represented on these memorabilia cards including Cam Newton, A.J. Green, Julio Jones, Jake Locker, Blaine Gabbert, Christian Ponder, Mark Ingram. These players figure prominently in other insert sets as well. 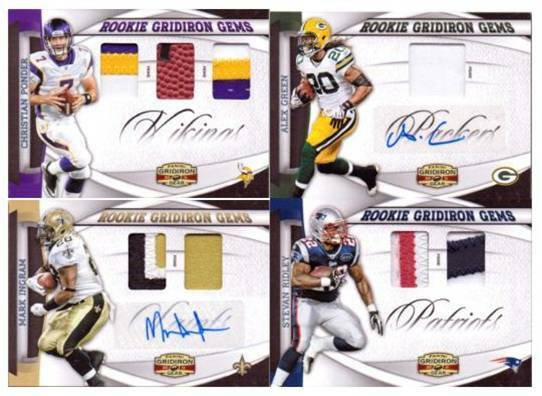 2011 Panini Gridiron Gear boxes have 18 packs of eight cards. Panini's Minimum Advertised Price Policy is holding prices steady at just over a hundred dollars per hobby box. With packs priced between $8 and $9, they're a bit of a gamble despite the solid odds of landing an autograph or memorabilia card (about 1:4 packs). Box purchases are recommended over going by the pack. This will guarantee you the four box hits and a variety of other inserts, parallels and base rookie cards. 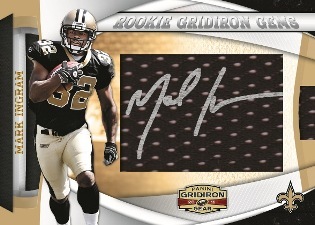 A complexly designed product, 2011 Panini Gridiron Gear has several unique and attractive memorabilia and autograph inserts, including the namesake Gridiron Signatures. The smartly designed cards look as though the signature is on an overhead shot of a football field. The playing surface tie in is a great compliment to the product and collectors lucky enough to find one should appreciate them. If you are a fan of retired players (And what longtime football fan isn't? ), then the chase for you is the NFL Pro Gridiron Signature cards. The 50-card subset has some of the game's biggest stars, including Bart Starr, Franco Harris, Jim Kelly, Marcus Allen, Mark Duper, Michael Irving, Frank Gifford, and Deacon Jones, just to name a few. The cards feature a large signature area, directly above an illustrated team helmet and a nicely sized player portrait in the upper left corner. This is a very well themed insert set, with tremendous value. None of the cards are numbered higher than 30. While I may be in the minority, I'm not a big fan of the Crash Course cards, either the regular or memorabilia versions. If I am a player or team collector, I don't want another player from another team on my card. While I do understand some of the pairings, like Brian Urlacher and Adrian Peterson on card 9, it's still not something I want to collect. Compound that with the fact that there are three different parallel versions and it's just useless filler. As you can see, with not hit numbered higher than 50, we hit a home run with this box. Secondary market values are holding up well for these cards, as well, as team and player collectors anxiously try to get their hands on them. J.J. WATT 2011 PANINI GRIDIRON GEAR ROOKIE AUTO AUTOGRAPH RC CARD #30 299! 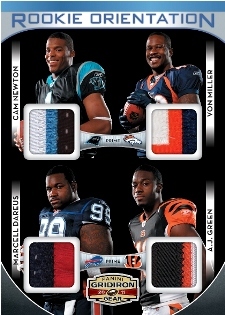 2011 Panini Gridiron Gear Football sets out to offer a slightly different spin on autographs and memorabilia cards. From signed jersey swatches that slide out and autograph windows designed to look like a football field, there's plenty of possibilities. Each 18-pack hobby box promises two autographs numbered to 349 or less and two memorabilia cards numbered to 299 or less. Rookie cards are inserted one per pack. Rookie cards inserted one per pack. Rookie Gridiron Gems return. These rookie cards feature a large autographed jersey swatch that can be slid out the side of the card. Each is numbered /349 or less and will fall eight per case. 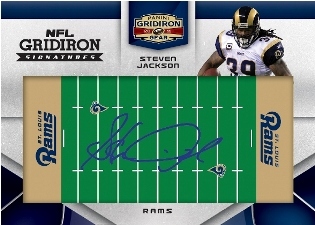 Although autographs not signed directly on the card may be less desirable to some, NFL Gridiron Signatures use generously sized windows designed to look like football fields to offer a more unique autograph canvas. Signers on the checklist include quarterbacks Drew Brees, Michael Vick and Philip Rivers. NFL Pro Gridiron Signatures stand out with their embedded rubber football helmet. Think of Upper Deck's Sweet Spot helmet autographs in both football and baseball, only vertical. 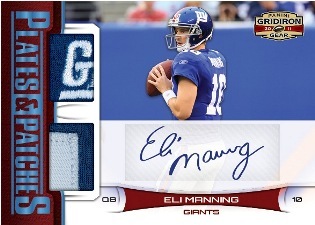 Plates & Patches Signatures have two prime jersey swatches to go with an autograph. Crash Course cards pair two players and their memorabilia. Why are there no top rookies in the base set (151-250)? That is an excellent question. That was a huge disappointment, especially considering how many rookie cards are inserted in the product. So you basically end up with a stack of no-name late round draft picks and early round linemen. DARRELLE REVIS 2011 PANINI GRIDIRON GEAR AUTO AUTOGRAPH CARD #3 5!